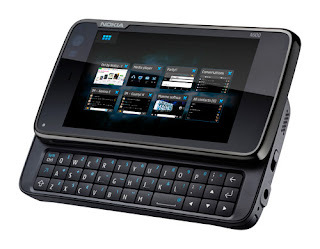 The Nokia N900 internet tablet is a fantastic gadget for geeks. It runs on the open-source Maemo 5 OS - which is a variant of Debian and for all intents and purposes, can be considered as a mobile computer rather than a phone. I regularly use Synergy to share a single mouse and keyboard between my desktop and laptop. Today while messing around with the Easy Debian LXDE, I had the bright idea to see whether Synergy can be used to share the mouse and keyboard with my N900 as well. It turns out I can! The biggest advantage of this is that it allows me to type on my regular keyboard - no more finger cramps while hacking away on the phone. 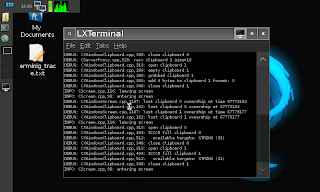 Having the ability to use the mouse in LXDE is pretty cool as well. Finally, don't forget the ability to copy and paste text between the computer and the phone - a very useful thing to have when you are editing config files etc. Now if you move the mouse to the right and outside of the monior, it will appear in the N900 desktop. Try clicking on a few icons and typing something using the keyboard. Pretty cool eh? Pretty silly thing to do actually. But it was fun and being able to use a full sized keyboard is awesome! its not silly, think about playing quake 3 on your phone with computers keyboard/mouse, fun stuff ..